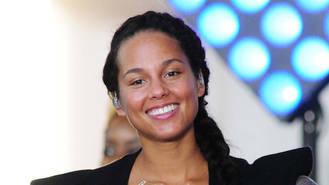 Alicia Keys' young children inspire the R&B star to keep up her fight against AIDS and HIV. The No One hitmaker has been raising awareness and funds for medical research since the 2003 launch of her Keep A Child Alive foundation, which aims to bring an end to the spread of the virus worldwide, particularly in Africa. She hosted her 13th annual Keep a Child Alive Black Ball in her native New York City on Wednesday (19Oct16), and Alicia reveals becoming a mother herself to sons Egypt, six, and 21-month-old Genesis, has only made her more determined to help find a cure for AIDS/HIV. Speaking to People.com just before her charity gala, she said, "It's always been way more impactful - even in part of my speech tonight, I talk about how the children who don't receive access to the medicine that Keep a Child Alive provides oftentimes won't reach two years old. And my son (Genesis) is just about to be two years old. Whoa. Can you imagine? "So, it gives me a reference point that's way different than even before. It's an even deeper understanding of why the fight against AIDS has to continue." Keys performed at the Hammerstein Ballroom event alongside rapper A$AP Rocky, while Patti Smith and Chance the Rapper also took the stage. Alicia was supported at the ball by her husband, producer Swizz Beatz, who expressed his pride at his wife's dedication to the cause. "I really see my wife on the front lines," he smiled. "What people don't understand is this is her every day. She's calling governors and signing petitions to change laws and she'll never speak about it. (For her to) be so humble and so graceful in her movements is very inspiring." Alicia's music mentor, mogul Clive Davis, was honoured with this year's humanitarian award at Wednesday's bash. Kings of Leon have secured their 5th UK number one with their seventh album WALLS. Olly Murs has been banned from performing at any official events in Manchester. Michael Buble regrets waiting so long to have children because fatherhood has made him realise what's important in life. Ben Haenow wants to write with Ed Sheeran after rejecting a song he penned for him. Hip-hop icon Jay Z has become the first rapper in history to land a nomination for the Songwriters Hall of Fame. Oasis turned down Trainspotting soundtrack because they thought it was about trains. Melanie Chisholm has blasted the ageist reporting of 44-year-old bandmate Geri Horner's pregnancy.